Have you got sewing fiends as relations or friends as fabric stashers?.... dont know what to buy them..One of these gorgeous vouchers is a must then. On a card stock with a matching envelope .. cutely stitched with some of favourite swatches. The voucher comes inside with the receivers name and unique code for spending. The voucher must be redeemed within 6 months from purchasing. 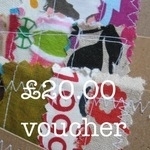 The voucher will be posted in waterproof envelope so it is not damaged in the post. If you would like me to pop the lucky recepiants name on the voucher - please pop it in the comments box ..